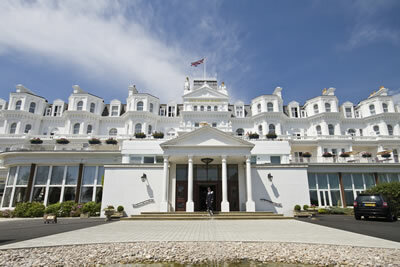 A great British institution: a weekend at The Grand in Eastbourne. Eastbourne is the seaside town to which my dear friend – the saintly Dr Cuthbert Cubitt Keet, Vicar of St Clement’s, Cambridge, for many a decade – would go each year for his fortnight’s holiday. In Eastbourne, and in Eastbourne alone, the godly priest would put aside his clerical collar and dress as a layman. As I turned the Royce off King Edward’s Parade into the drive of my hotel, I had some sense of why he was happy to relax in this South Coast resort. It still manages to be what he always was: quiet, calm, reserved and gently old-fashioned. In fact, just like The Grand. Known to the locals (not in their most imaginative mode, it has to be said) as ‘The White Palace’, this sprawling Victorian pile has dominated the western end of the esplanade for over a century – welcoming kings and queens, as well as all those lesser mortals who have wished to combine a little sea air with the comfort of a five-star hotel. As a small boy, I would listen to the wireless on Sunday evenings and enjoy a programme of light classical music, broadcast “from The Grand Hotel”. And this is that very place. I had prepared myself to be disappointed. Childhood daydreams are seldom fulfilled, and so many famous seaside hotels have declined into tattiness since the 1960s. But even as I walked down the long entrance hall, under bright chandeliers, past noble columns, I could see that The Grand is not only alive and well: it is flourishing. Upstairs, the corridors are well kept and handsomely furnished – always a good sign. And my first floor suite at the front of the building (Room 128) was a model of what can be done with these gracious older structures. Space is what they have in abundance, and here it was well used. Through the door and I was in a hall with a sufficiency of fitted wardrobes. Ahead was the bathroom, tiled and equipped with excellent 5-foot bath towels. To the right was the sitting room, with pieces of mahogany furniture and a sofa and two easy chairs in pink velour. Through an archway was the bedroom. High ceilings, full-length windows, a light colour scheme (green carpet, striped wallpaper and flowery curtains) and the uncluttered nature of the furnishings meant that the overall impression was both airy and comfortable. Food at The Grand can be pretty good, too. In 1989 the hotel opened a smaller alternative to its large, main dining room. The Mirabelle Restaurant now has in charge of its stoves Gerald Röser, whose former (eponymous) restaurant in nearby Hastings boasted a Michelin star for many years. He has a pleasant, softly lit room into which to send his dishes, but I would urge upon him attention to the glasses. Those normally supplied are of a cut-glass kind and are of no use at all. (Our very pleasant waiter, a young Belgian called Pierre-Stèphane, rushed off and returned with some good ones made by Schott.) This is an important matter here, for the substantial wine list offers some glorious bottles – like 1961 Haut Brion (£950), 1988 Sassicaia (£255) and 1990 Penfolds Grange (£365). I began with a super dish, which reminded me of the quenelles de brochet at Tour d’Argent in Paris. This pike soufflé, with smoked salmon and dill sauce, was beautifully executed – delicate, yet still luscious and tasty. Then a cappuccino of wild mushrooms filled my mouth with robust, earthy flavours. Excellent. Roasted lamb let the side down a little (the accompanying reduction was too fierce), but standards were back up with the precise tastes of an iced raspberry soufflé. These four courses were taken from the two 3-course menus available (at £35 and £42); a 6-course tasting menu is priced at £55. I drank modestly but well. The list provides lots of notes. It described my Australian white as “full, rounded…melon, peach aromas…subtle oak vanilla flavours”. With all of this I concurred, making the 2000 Tyrell’s Old Winery chardonnay good value at £18.50. My Spanish red yielded some good earthiness in the nose, but was a bit lean in the mouth (Nekeas Crianza, Navarra, 1998 - £21). After a hearty breakfast the Silver Cloud wafted me back to town. I was a man who had enjoyed his experience of a great British institution – a weekend at The Grand in Eastbourne. King Edward’s Parade, Eastbourne, East Sussex, England.